Can you believe Halloween is back again? Worse yet, can you believe it's supposed to snow in NYC tomorrow?! Twenty-nine years of it and it never gets any easier. Anywho, so are you guys dressing up for Halloween? I haven't been able to decide what to be or where to go (though considering Steve Jobs' passing, this 2008 iPod dancing silhouette costume came to mind) so as of now I've got nothing. But that doesn't mean I can't celebrate in other ways. Below, some Halloween-inspired treats for a sweet weekend. Enjoy yours! Halloween cupcakes in a jar. Cute and creepy versus spooky and playful treats. Candy creatures and Frankenstein marshmallow pops. Candy corn cheesecake mousse. 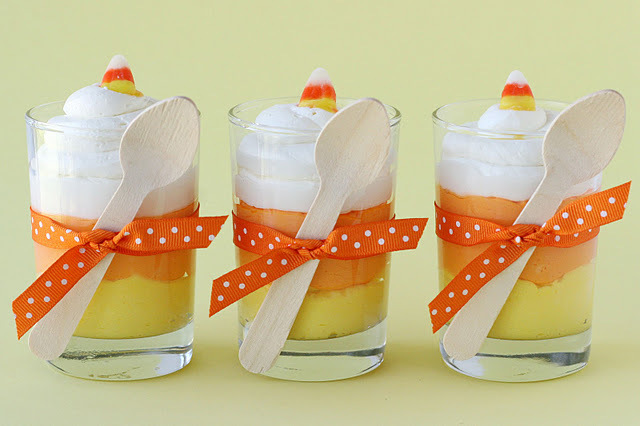 Even though I'm not a fan of candy corn, cheesecake, or mousse. Are you? oh, all of those recipes look so yum! i wish australia celebrated halloween! in response to your question on my blog - i think im planning on getting a nikon. what time canon do you have? would you recommend them? Yum! Those all look so delicious! I don't ususally dress up. Kinda boring, I know. I'm not dressing up; I'm just being myself... That's scary enough! I did consider it, but I've been so busy arranging other things that a costume never got more than a passing thought. I'm doing some baking and other things though. With all this slush, snow, and freezing weather, all I can think about is that hot apple cider. Had to trek out in the snowstorm to grab one from Starbucks. SO good. And SamanthaJoy, I got a Canon Rebel T3i. Totally recommend Canon, but Nikons are very good too. From what I read/learned before buying, both are very respectable companies so you should be good either way. I am dressing Anna up as a butterfly. Hopefully we will have a drama-free Halloween! !